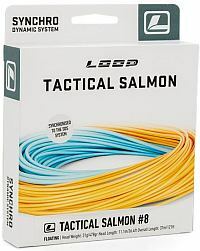 The SDS Tactical Salmon Lines are a range of double hand flylines designed specifically for fishing environments where presentational techniques are pivotal to success. The Tactical Salmons taper dimensions are optimised for both overhead and modern speycasting techniques and feature an integrated head and running line configuration. This allows for seamless fly retrieval through the stream when presenting flies at a range of fishing depths. 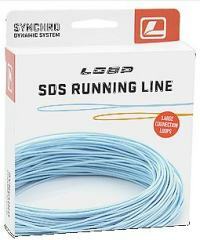 Loop's New Synchro Dynamic System (SDS) is quickly set up on the riverside by a simple loop-to-loop connection process. Their new welded loops are the strongest we have tested during the extensive development process and connect the system together in an ultra-slim loop-to-loop profile. This allows for unbroken transfer of power from the belly through the attachable tip to enhance fly presentation. For ease of identification, each head and interchangeable tip are laser-marked with their designated line classification to insure the correct line to rod balance is achieved. 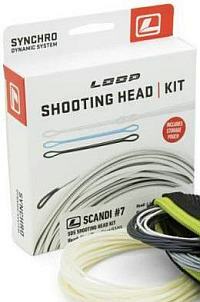 The new LOOP SDS Switch System is a totally interchangeable shooting head solution for modern two handed fly fishing techniques with switch and double-handed fly rods. Comprising of one floating head and three density tips, the SDS system offers a comprehensive cross-section of fishing applications for the pursuit of multiple freshwater and anadromous species. Each of these tips incorporate our latest MDS depth technology to ensure the defined sink rate is both accurate and uniform as the fly swings through the stream. This density compensation integrates unique seamless multi sinking rate technology to maintain a controlled sinking profile from the loop-to-loop connection along the entire length of the tapered tip. All sinking tips are supplied in a handy mesh wallet for ease of storage and transportation. 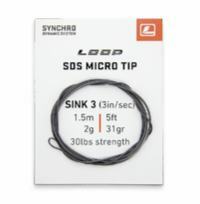 Loop Tackle's SDS Micro Tips offer additional flexibility in fly depth control in a range of varying fishing conditions. 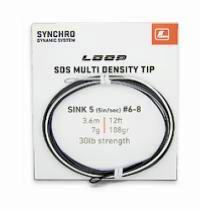 By simply attaching via a loop-to-loop connection, each density tip offers total synchronisation to the main SDS system as well as other fly line profiles. Designed to complement transitional power through the fly line system, our micro tips enjoy zero hinging during outbound extension and superior fly presentation as well as depth control. The all new SDS Scandi System is a totally interchangeable shooting head solution for modern two handed fly fishing techniques with switch and double-handed fly rods. Comprising of one floating head and three density tips, the SDS system offers a comprehensive cross-section of fishing applications for the pursuit of multiple freshwater and anadromous species. Our new SDS running lines are designed to offer both superior line shooting performance and unparalleled longevity of use. Built on ultra low stretch central core, the SDS running lines offer outstanding slickness and minimal contact friction with the rod on each outbound cast. With excellent shooting properties as standard, the ultra low stretch characteristics of SDS running lines also ensure rapid and positive detection of even the slightest of takes. 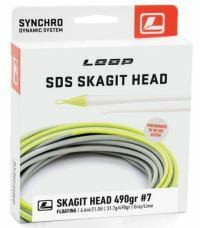 The SDS Skagit heads offer seamless integration to the SDS system and are the ideal line solution for confined fly fishing environments where rapid depth and fly presentation is fundamental to success. The Loop T class sinking tips have been developed to perform in total unison with our new SDS Skagit head. These fast sinking tungsten tips offer deep water fly presentation when migratory fish are reluctant to lift high in the water column to intercept flies. Each tip is 12ft in length and benefits from slim-profiled welded loops at both ends. 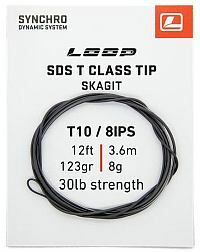 SDS T class tips are available in T10 (8IPS), T14 (9IPS) and T18 (10IPS) density classification. 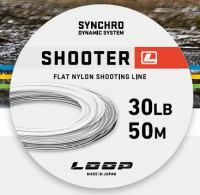 The Loop Shooter flat nylon line is designed for ease of use with modern shooting head and skagit line systems. With its optimal cross section profile for minimal contact friction on the outbound cast, this Intermediate Shooting Line is highly effective for distance fly casting.